VCVRackTutorial: The Turing Machine – Do My Eyes Look Scary? The two implementations of the Turing Machine Sequencer — in the case of this patch, the one from the Skylights plugin — are not immediately understandable without doing some reading of manuals, which is never anyone’s favorite activity. 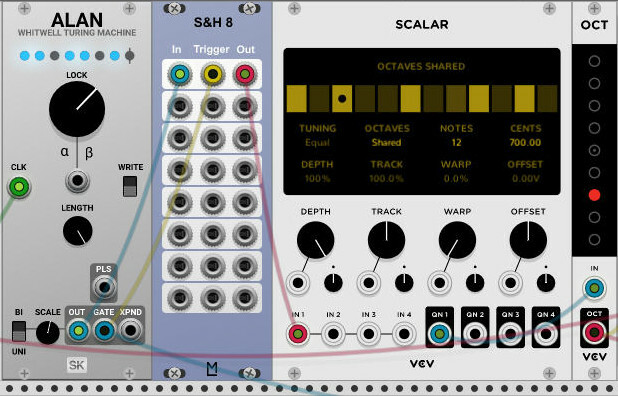 Turing Machine sequencer have a property that is one of the best about modular synthesis (or in fact music in general) in that it takes a single simple idea and implements it in a way that can have surprising and musically useful results. There’s a full document describing what the Skylight folks implemented here, but I think I can describe it very simply. If you look at the byte symbol above, it shows how it is comprised of bits. A particular sequence in the Turing Machine uses this byte (or 16 bit word, maybe) in two ways. The bits are rotated in the buffer. And by ‘rotated’ I mean that each bit is shifted left, and the last bit on the right is placed in the leftmost bit location. This makes sense if you visualize it physically. If you had a row of black & white marbles, you take out the rightmost marble, and place it in the leftmost position, shifting all the other marbles right one space. In computing a byte is two things: a collection of bits, and the representation of a number in the range of 0 and 255 (or often, one of the ASCII characters). The Turing Machine Sequencer uses those two representations to generate a pitch and a gate signal. The pitch is the numeric value of the byte, and the gate signal goes from zero to one when the rightmost bit is one. That’s all that really happens, except for what the LOCK knob does. When the knob is fully counter-clockwise, every time the sequencer receives a clock, every bit in the sequencer’s byte is replaced by a new, random value. When the knob is at 12 O’Clock, half of the bits are randomized. When the knob is fully clockwise, the sequence is locked, and none of the bits change. So when you use the Turing Machine as a sequencer you have a choice between an always changing random sequence, an unchanging sequence, and a sequence that changes gradually over time. This example patch comes with a locked sequence that sounds like a classic analog sequencer patch from Kraftwerk or Tangerine dream. The output of sequencer is a tunable combination of chaos and order. It follows a very musical paradigm. If the LOCK knob is somewhere around 3 O’Clock it means that the sequence playing changes very slowly a note or two at a time. 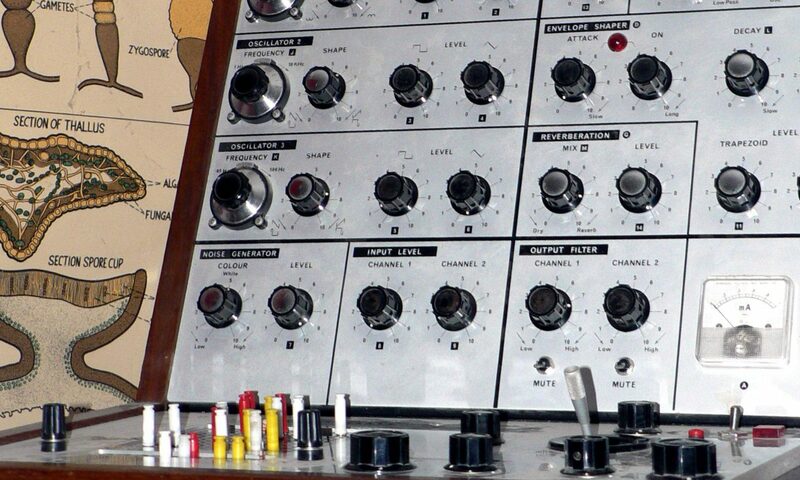 It also has one of most charming features of modular synthesis: Because of how the pitches and triggers are generated, the pitches and triggers have a deep structural relationship. A change in underlying data byte changes both the pitch and trigger in a predictable way. Well, mostly predictable, as it does it’s magic by random, probabilistic bit flipping. When two things in music have that kind of relationship, where they’re both tied to different views of the same input, it’s something you can hear. The sound of the SkyLights Alan Turing machine is the sound of that relationship. The pitch coming out of the Turing Machine changes at every clock step, so I run it through a sample & hold triggered by the gate output of the Turing Machine. This means that the note only changes when a new note is triggered. Then it’s quantized by VCV Scalar. I’ve selected notes that are a sort of 5 note scale, but different than the standard pentatonic scale. This is followed by a Fundamental Octave module, that transposes up or down by one or more octaves. This is kind of a standard setup for most sequencers that I use, because I want things to add up musically, and I want one pitch per note. You can certainly bypass the sample & hold and go directly from the sequencer to the Scalar Quantizer , if you want the effect of the note pitch changing as it decays. Next PostNext VCVRackTutorial: Using Multiple Waveshapers to Drone.